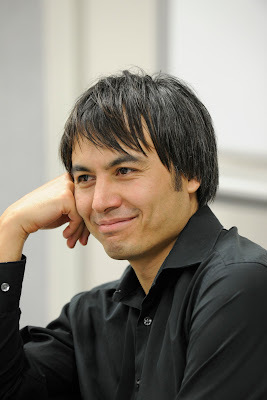 ARE 2012 1st Keynote Speaker Announced: Adrian David Cheok Inventor of “Krazy” Augmented Reality! The line up of luminary speakers to keynote at ARE 2012, the world’s largest augmented reality event, will blow your mind. The first we are revealing is Adrian David Cheok, Professor at Keio University, Graduate School of Media Design, in Tokyo Japan, as well as a Young Global Leader at World Economic Forum. Dr. Cheok has been a hero of mine in pushing the envelop of augmented reality. He will join an amazing group of keynote speakers in previous years. Adrian has been a champion of the idea that Augmented Reality is more than just about the visual sense, but has to include all the senses. Over the years, he’s been working hard to prove his idea and created many prototypes of augmented reality systems that involve the other senses. To warm you up, check out his Hug Accentuator. I can’t wait to see his Kissinger system in action. Dr. Adrian David Cheok also created the first real world Pac Man game. When he wanted to create an exciting augmented reality game, he chose to remake the first video game to ever introduce a character – the legendary Pac Man. Cheok literally stepped into Pacman’s shoes in this first-person-shooter-like real world game. Make sure to register for ARE 2012 before the early bird discount expires on March 21st. Adrian David Cheok was the Founder and Director of the Mixed Reality Lab, Singapore. and previously worked in real-time systems, soft computing, and embedded computing in Mitsubishi Electric Research Labs, Japan. Mr. Cheok has been working on research covering mixed reality, human-computer interfaces, wearable computers and ubiquitous computing, fuzzy systems, embedded systems, power electronics. He has successfully obtained funding for externally funded projects in the area of wearable computers and mixed reality from Nike, National Oilwell Varco, Defense Science Technology Agency, Ministry of Communications and Arts, National Arts Council, Singapore Science Center, Hougang Primary School. The research output has included numerous high quality academic journal papers, research awards, keynote speeches, international exhibitions, numerous government demonstrations including to the President and Prime Minister of Singapore, broadcast television worldwide broadcasts on his research (such as CNN/CNBC/ABC/Discovery/National Geographic etc. ), and hundreds of international press media articles.